The difference between a managed and unmanaged network, and the steps to take to support it. Essentially, essensys is responsible for managing all aspects of a managed network. A managed network is how we would refer to a network which is created, configured and supported by Connect and the essensys switches in your comms/server room. Most of the clients in your building will use a managed network, as it allows you to easily add and change ports, create WiFi networks and monitor their usage in great detail. Managed networks are simple for us to support as we have full visibility of them, A-Z. Some clients prefer to manage their own networks, and want responsibility for their own IP addressing, security and routing. When a client does this we lose the ability to perform indepth support for their network, especially their local network (or LAN), as we have no visibility of it. There are many different styles of unmanaged network deployments, some involve our equipment more than others. For a customer to be able to manage their own network they would need to supply their own router or firewall, which they will configure themselves. We strongly recommend that the client uses internal or 3rd party IT for this process. A Public IP is needed for each device that requires a separate public address. This firewall/router will be configured with a public IP address which is ordered through Connect, and is then displayed on their Service Guide. The client may require one usable Public IP address or if they have several devices the might need five usable Public IP addresses. The WAN side of their configured router/firewall will need to connect to the Public IP port on the switch. 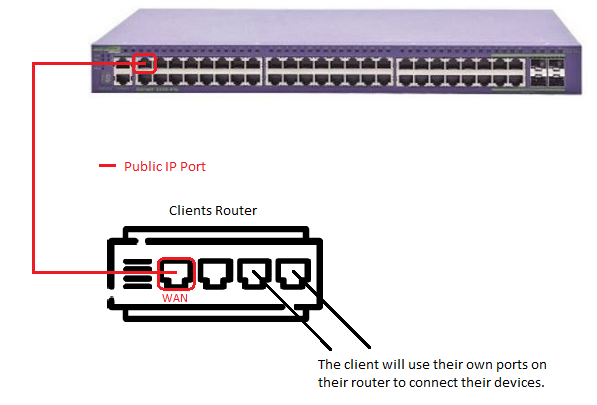 However, if the client would like to connect their computers to the back of the phones, you need to assign a LAN Only port on the Connect Switches page, and connect this port to the LAN side of the router. All other ports are then configured for ‘Voice, LAN, Internet’ as per usual. essensys recommend that the client manage their own DHCP, you can disable the DHCP on their VLAN from the Network Info page on Connect. From the Clients menu, highlight the specific Client, click the More drop down menu and select Network Info. In here you are able to disable the DHCP provided by essensys so the Client is able to manage their own. ( More information can be found on DHCP here). If the client has their own switch, they would connect this to the LAN side of their configured router/firewall. All floor ports in the office would then connect to the client’s switch. If the client's router has wifi capability, this should be disabled in order to reduce the possibility of interference in the building.